A couple of weeks ago, me and my lovely big girl went on a little mummy and daughter excursion and took a class on how to make delicious teeny animals out of felted wool. My felting experience is pitiful, but Little Miss Stitch is quite the felty expert so I agreed to be her adult helper (even though it was clearly the other way around!). Our teacher was the multi talented Rachel who is more usually eulogised on this blog as the bringer of all things cakey and delicious to my classes. However she is all kinds of wonderful and is also a super duper felter, knitter, spinner and all things wooly, as well as stitcher, baker and generally all round lovely lady. Now if you've never tried felting before I would highly recommend you give it a go. 3D felting involves taking lovely fleecy natural wool 'tops' and repeatedly stabbing them into submission with a menacing looking needle. What’s not to like?! I started somewhat dubiously stabbing my wooly ball of non-mouseyness, but miraculously under the patient tuition of Rachel and with some help and advice(!) from dear daughter, my mouse did actually start to emerge! What fun! Miss Stitch has not stopped stabbing little balls of wool since and we are now the happy owners of a whole felted wool tree trunk home of mice, rabbits, ladybirds and butterflies. It turns out that with only a ball of wool, a piece of foam, and a long needle a 10 year old can basically create whatever their heart desires in wool. (Apart from the huge sharp needle element) isn't it just the perfect kid craft? There’s nothing I love more than seeing kids imaginations bought to life through their creations. It leaves me wondering why we don't celebrate this more in our schools today. Is it more important to teach a kid to spell than to teach them to imagine and create? Ho hum. 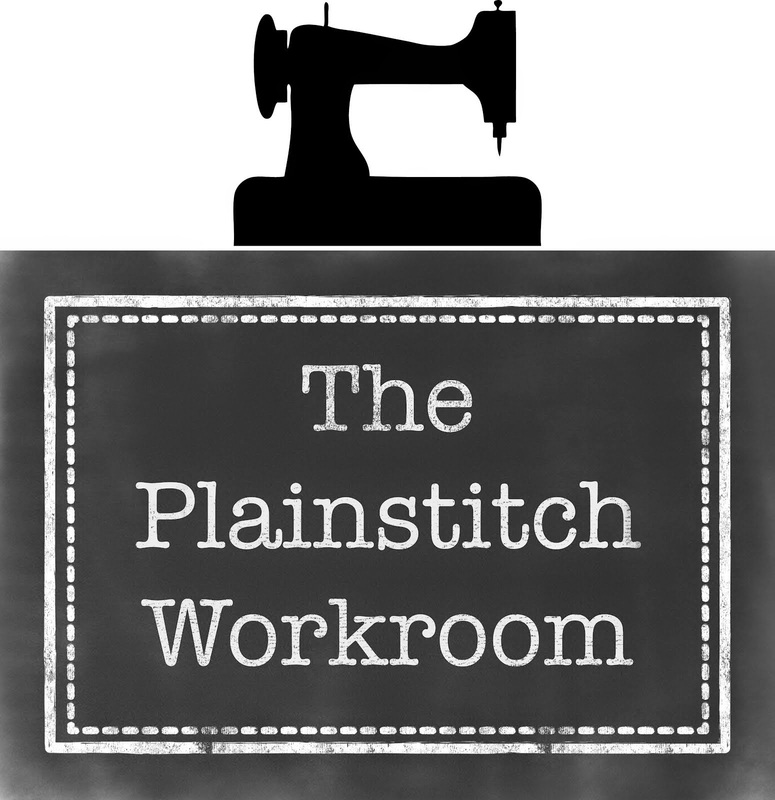 *** Stop Press*** Rachel has offered to run some felting classes for PlainStitch in the autumn - Details to follow and watch the Autumn 2013 page to book. I can't stop sewing paper pieced hexagons. Every spare moment I get I figure I can whip stitch up a quick hex. As a result this quilt is coming together at speed. Which is just as well as I have about 10 other paper pieced projects, that I want to make a start on for my class next year, just swirling around in my head. And you know how dangerous that is? I'm heading for an MPO breakdown (Multiple Project Overload). You've been warned. There may be tears and serious sewing hand cramp! I am feeling so super lucky. I am the proud owner of a preview fat quarter bundle of Heather Ross's much anticipated Briar Rose collection! AGGHHH! It's too exciting. You can tell how exciting it is as I couldn't even wait to take nice pics of the fabric outside - this shot is 5 seconds before I started chopping into it! I've been ruminating on the perfect project for this lovely fabric ever since I saw the preview info. It's no surprise to anyone who follows this blog that I love Heather Ross almost as much as I love hexagons and english paper piecing. It's the perfect summer project as the pieces can be sewn anywhere. Given that I spend most of my summer sitting on the boundary at a cricket match or sitting watching my kids thunder past on horseback I figured this was for me! I make up the pieces in advance. I don't baste. I iron on freezer paper and then use basting glue to secure the backs. This makes a super durable template that will survive the rigours of my handbag for weeks on end. My plan is to run an English paper piecing class next summer so this is a great try out of my planned pattern. I've been flexing my maths brain for this project, drafting a hexagon then subdividing it up into smaller bits to make fractured hexagons. I've no real plan of how far my fabric will go so this project will be an organic one. Given how many of these babies I cracked through in one thrilling cricket match last night I'm thinking i'll have this whizzed up in no time! Check back for pics of my work in progress! I have no idea why its taken me so long to get back to making my own clothes. When I was a student I made long silky flowery skirts to wear on a night out with little vests in a freezing northern town, when the shops were full of 1990's black bootleg trousers and the only skirts you could buy had elastic waists! The thing is, then I had quite low construction standards. As long as it didn't fall to bits on a night out it was fine. I made my own patterns. That sounds too grand. What i did was lay a favoured skirt down on top of the fabric and drew around it. Invariably I found the whole construction a bit hit and miss. I had a tiny pink singer featherweight sewing machine that used to bounce itself off the table if it had to go through anything thicker than three quid a meter polyester from the local market. Fast forward 15+ years, hundreds of quilts, miles of bunting, several dozen kids pjama trousers, but never again have I felt the desire to make myself something. It was kind of creeping up on me after the Great British Sewing Bee and all those amazing Liberty and 1940's styled dresses. I loved the GBSBee but I kind of felt it missed an opportunity to show more of the construction and skills that the contestants were showing. I could see they were fab, but I was none the wiser about how to start sewing my own dresses. I aquired a pile of old books on garment construction and started to read. I drew myself a pattern based on a favourite dress from Kew ( what happened to Kew? Loved their occasional Liberty tops). Then I saw a Staple Dress ( by April Rhodes) on a blog. It was THE SAME as my Kew dress, except it had an ACTUAL PATTERN. Now I get that this should not be a revelation to me, but doh!!! Sewing from a pattern is, like easy! Yipeee. The flood gates have opened. I've made three dresses in a week ( 2 for me and a Tweenie Staple). Admittedly I couldn't resist a dabble with DIY pattern cutting. The final pattern I went with was kind of a hybrid of my Kew dress with the Staple. I didn't shir the waist, and I scaled the whole thing down for my 10 year old daughter. Its a great pattern, especially for summer, with really easy to follow instructions. I can't recommend this pattern enough as a first dabble into dress making. I made my first version in Liberty. I couldnt resist a bit of quilters fabric play and added the facings in a kind of neon mustard solid I had. For this dress I made a matching fabric casing and made a tie belt ( as that was how the Kew one was made. The next day I bought this gorgeous linen mix denim fabric and made a second dress. I scaled down a size on the top which I prefered. As this was a slightly thicker fabric I felt that the tie middle option wouldn't gather up properly so I again made a facing and added elastic inside it. I LOVE this dress. It will get worn all year round. Then my daughter got in on the act. She had a Boden dress from last summer that is also this style ( although the Boden one also has a gathered neck. )It was getting a bit periliously short so we decided we could make a version of the Staple for her. We scaled down the pattern using her dress as a guide. I used Sweedish apttern paper and tacked the whole thing together to be sure on fit - its fab stuff. We just used quilting cotton for this one ( this is Lotta Jansdotters new line, the pink is so pretty). I've just ordered myself this pattern the Amelia dress which I've also heard good things about in blogland. I also want to make this and this. But first I have 6 pairs of pjamas to sew! Enough indulgent mummy sewing for a bit! It was our fabby Bee morning yesterday and it was just so much fun. I know I rattle on a lot about how even more enhanced the fun of sewing is when you multiply it by friends, but it's just soooo true! This week I actually did do some sewing rather just running about chatting and harping on about just how LOVELY it all was! I need a new set of Rayburn Mats to go on top of the shiny lids to protect them when I dump hot things unceremoniously down on them (usually as I've tripped over my dog who loves to play 'who can get most in the way at tea time' as she inches closer to the warm stove, love her). I made these ones way back when, but given that they should probably get a wash at some stage (!) I thought I'd better make a new set. I love the blue and pink combo and i'm working on some new blocks for a modern machine piecing class I'm pondering at the moment for next spring so I figured I'd try out one of my favourite blocks, Rolling Stone. I've finished one and the other is half done so all in all, a productive day. Ok, this is the last log cabin for a while I promise! The last of my class samples for the autumn log cabin extravaganza is finished and is now residing on the very large pile for backing and basting. I then intend to spend the long summer hols in a deckchair hand quilting my way through them in time for the end of Sept. I'm so loving the little dog in a jacket! This wonky log cabin was so much fun to make. Its completely made up of strip scraps ( usually surplus ends of binding that I toss into an overflowing bag in my sewing cupboard!). The middles are made up of some of my most precious Heather Ross prints that this post recently reminded me of! I really want to eek them out so pairing them with scraps is a great way to make a quilt out of nothing really! I remember the first time i saw a 'liberated' quilt. The great Gwen Marston is a the queen of the genre and when I first read her book it blew my mind! Its looks so complicated! But it's so easy! Throw away your ruler and stop measuring stuff? Yes please! Wonky log cabin remains one of my favourites to make. I'm really excited about teaching this method in my class - it always busts open the creativity and allows people to play with their fabric rather than worry and measure and feel that patchwork can be hard. Teaching this method lets me sing from the rooftops ' look how much fun it is!' When did you last play like a kid with something? Its good for the soul! Peggy and Vic Oliver my chickens either love this or they want me to seriously examine my sanity. I'm not yet fluent enough in chicken to decipher which message they were loudly conveying here! I'm calling this baby quilt, 'Small Bear in a Big Log Cabin'. Can you see the cute bears in the middle? And I'm calling this Picture Frames Log Cabin Variation, 'Gaucho Kate' as it's inspired by and destined eventually for a Little Girl who just LOVES playing with ponies, big and small.